The Bengal breed is descended from Asian Leopard Cats (Felis Bengalensis). 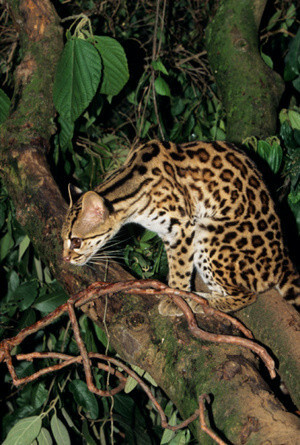 The ALC was crossed with domestic breeds to create a hybrid that possessed the exotic wild look of a leopard but with the temperament and safety of the domestic cat. After years of dedicated development the Bengal has become a wonderful companion pet with the exotic wild looks of their ancestors and the companionable traits of a house cat. Bengals are wonderful companions for the whole family, including children and other household pets. They are a very active cat that enjoys being in the middle of the household activity. Bengals enjoy and participate in creating happy chaos and activity. At times they will leave you in both tears of laughter and sometimes frustration at their antics. Bengals are not couch potato cats. They are playful, active, inquisitive, nosy, comical and affectionate. Many are vocal "talkers" who will greet you with meows and coos expressing their moods and the joy of being with you. Because Bengals love to play and be involved getting into things, you will find hours of enjoyment watching them stalk, pounce, chase, fetch, climb, bound and generally revel in the exuberance of life. Bengals are a highly intelligent breed and therefore are easy to train, not only in basic "kitty etiquette" but also in tricks like come, sit, beg, speak and games of fetch. Bengals can be taught to walk in harness on a lead. Bengals are not the cat for everyone. If you are looking for a low key, quiet cat that sleeps most the time and is more of a pillow ornament, then the Bengal is not for you. The Bengal does have their lounging times but they are a highly active cat that enjoys living life to the fullest. Please also note that the Bengal is a highly social cat that should always be kept in groups of atleast two cats.